The Pedestrian Got Hit Scam! 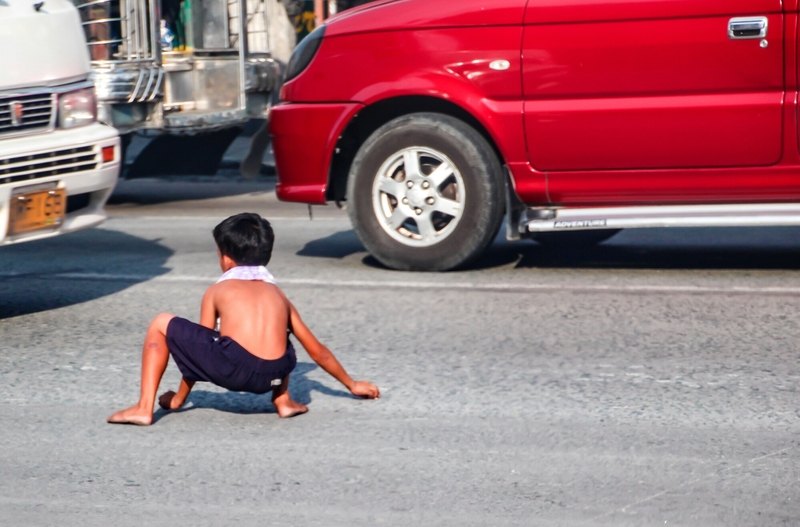 Some roads in Metro Manila are infested by aspiring actors who pretend that they were got hit by motorists and then ask their victims for money. They time their acts when a car is about to stop due to the slow traffic and they will immediately run towards it and act as if they were hit “badly”. Then they extort money from their victims. That’s how ugly the world is in a country called the Pearl of the Orient Seas! this is sad unfortunate reality. dangerous profession, the kid could get badly hurt if he mis-timed his act. is this operated by syndicates? Usually, they are managed by underground syndicates… To make matters worse, these syndicates are protected by the scalawags in the police force. The kid could actually get hit because of his stupidity, he’s leaping in front of an actual car! Yup… And the driver is ultimately the victim there if something bad happens! That’s like playing Russian roulette. The kid could really get hit by accident not by the fault of the driver but because was suddenly there inviting danger. Stupidity! Exactly, stupidity it is for a php500 to a thousand pesos. Hehehe! You can then extort money from him to keep his secret safe…! Bwahaha! Tell that to Sophie Bananaaaaaah! Check out her post. Muahahahaha!